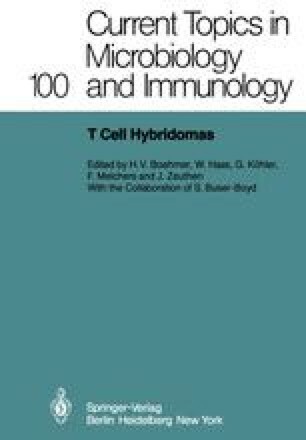 The goal of our work is an in-depth analysis of the thymus derived lymphocyte (T cell) and its products. T cell functions, products and molecular biology can now be analyzed through the use of continual T cell lines and hybrids. Primary T cells can be. immortalized within the milieu of a proliferating AKR Thy 1.1+ HGPRT- lymphoma, BW 5147, through the technique of somatic cell hybridization and selection in HAT medium. Constitutive traits such as isozymes, Thy 1 and H-2 antigens of both parents, and antigen specific activity of the primary parent can be expressed by such hybrids (1, 2, 3), and expression of many such activities is regulated by culture phase (4). We (5) and others (6, 7) have demonstrated constitutive production of antigen specific suppressor factors by such hybrids. However, it is not always possible to obtain a T cell hybrid that maintains expression of all functions of the primary parent, as chromosomes may segregate from T cell hybrids with concomitant loss of traits. This situation also occurs in B cell hybridomas (8) and all other types of somatic cell hybrids (9).